One of three American service members killed in a roadside car bomb attack on a convoy outside of Afghanistan’s Bagram Airfield on Monday was a New York City firefighter, officials said Tuesday. Marine Corps Staff Sgt. 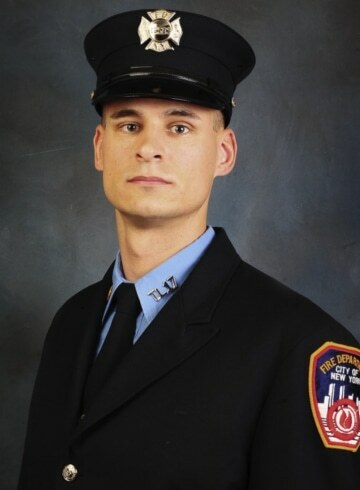 Christopher Slutman, a 15-year veteran of the New York City Fire Department, worked for Ladder Companies 27 and 17 in the Bronx, according to the Uniformed Firefighters Association. He was also a 19-year volunteer with the Kentland Fire Department serving Landover and Prince George’s County, Maryland, according to Chief Oleg Pelekhaty. Slutman was on active duty in Afghanistan on Monday when the roadside bomb went off, killing two other U.S. service members and wounding another three. The Taliban claimed responsibility for the attack. New York City Mayor Bill de Blasio ordered flags to be lowered to half-staff Tuesday. De Blasio said in a statement that he had presented Slutman with the Fire Chief’s Association Memorial Medal in 2014 after the firefighter had saved an unconscious woman from a burning South Bronx apartment. “This unquestionably is an example of the measure of this man. Christopher Slutman is an American hero, a New York hero, and we mourn his loss today,” De Blasio said. Slutman was married with three daughters. A ceremony honoring him was planned for Tuesday night at the Engine 46, Ladder 27 fire station. He is the fourth FDNY member to die while serving in Iraq and Afghanistan since 2003, according to the department. Seventy-three FDNY personnel are currently serving on extended military orders and another 1,425 are military reservists or veterans. U.S. officials originally said that a contractor had also been killed in the attack, but they found out the contractor, an Afghan citizen, was alive and had been treated for his injuries with civilians, the NATO-led Resolute Support mission said in a statement Tuesday.